Our Personalized Wedding Shower Can Coolers are a great wedding favor and much-beloved keepsake for guests to take home and keep the party going! These neoprene or sponge foam can huggers are custom printed with bride and groom's names in trendy script font, along with heart design and the wedding date. Great for cans or bottles, these coolies are a fantastic memento of your big day! The ubiquitous can cooler. Often known by coolie, coozie, KOOZIE®, beer hugger, it keeps your drink cold when the weather is warm - or, in our case here in Texas, HOT! We offer a variety of collapsible options, all of which are made and printed in the USA. The heavy fabric that scuba suits are made of - very dense and insulating to keep the cold in and the warm out. These coolers hold tighter than others, and, though a "can" hugger, they also work well with more narrow beer bottles. It is the premium collapsible coozie material. Available in a variety of colors. Their dense structure allows the ink to print crisply, excellent for designs with fine details. Neoprene huggies are accented with zig-zag stitching on the side seams, and can be printed on both sides. 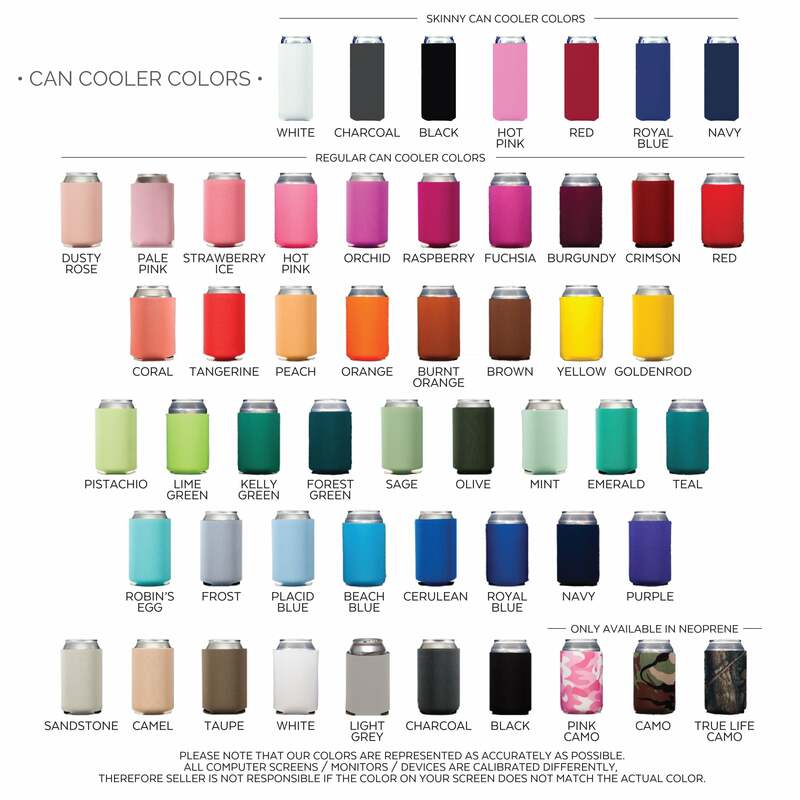 The most common can cooler material. Economical. Available in a variety of colors. Sponge huggies have hidden stitching on the side seams, and can be printed on both sides. Available in both Sponge Foam and Neoprene materials. Pull out all the stops. Watercolor designs, photographs, multi-color images can all be printed on our full color coozies. Printing on both sides and on the bottom available - we suggest a monogram, a heart, a date, or some other surprise on the bottom for when your guests tilt one back! These are digitally printed with a high-quality sublimation process for an upscale look. Metallic inks are unavailable on these items. The original can kooler made of a dense sponge foam. Available in a variety of colors, and can be imprinted on both sides. Minimum of 200.